I need to teach. Having squandered my chances for doing this in a conventional classroom setting, teaching became a big part of my management philosophy. My colleagues were shepherded through times of instruction, assignments and career planning in order for them to graduate into far more promising and rewarding positions than I could offer them at the small non-profits I directed. Even now in retirement I need to teach and writing is the means for me to do it. Welcome to my classroom. My blogging efforts began while still in active management. It was the best way for me to reach the general public with weekly messages designed to earn their trust. Three fundamental themes were strongly emphasized: transparency, accountability and vision. I continue to write from the perspective of former manager. The topics are unlimited as I view the world from management exile, but the dominate themes remain to same. 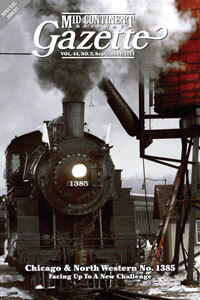 This 2011 publication was the first in a series of four using the Mid-Continent Railway Historical Society’s member magazine to promote the campaign to restore its premiere steam locomotive. The goal was to use the Society’s own archival records, supplemented by photos and documents from outside sources, to tell the locomotive’s full history during its time of service at Mid-Continent’s operating railroad museum in North Freedom, WI. It is the second time the magazine has been used as an economic way to create a case statement for a capital campaign. Copies of the magazine may still be purchased from the Historical Society by contacting them via e-mail (inquiries@midcontinent.org) or by phone (608-522-4261). This second in the series focused solely on the year 1982, when the steam locomotive was leased back to the Chicago & North Western Railway as the motive power for a special tour throughout the North Western rail system. Originally dubbed The Prosperity Special, the steam locomotive pulled a collection of new rolling stock as a promotion for the North Western’s modernization program. The tour was so successful that dates were added and a commitment reached with Mid-Continent to do it again the following year, only on a grander scale. Unfortunately, this publication is out of print and no longer available for purchase. This special edition of the Mid-Continent Railway Gazette was the third in a sequence of reports on the history of the museum’s most celebrated steam locomotive, the C&NW No. 1385. The content of the magazine focuses on the expansion of the off-line excursions across the North Western’s system, taking the locomotive, its crew and an awareness of the Mid-Continent Railway Museum in rural North Freedom, WI to a new and much larger audience. The magazine is illustrated with photos, maps and scans of archival documents to help the story of this important episode in the museum’s overall development. Copies are still available for purchase from the Historical Society. And to learn more about the story behind the story, just follow the link to the February 24, 2014 web log message A Special Edition Gazette. The final installment on this series about this prized steam locomotive required most of the research to take place at the archives of the Circus World Museum in Baraboo, WI. The magazine’s content chronicles the three years that the steam locomotive pulled The Great Circus Train from Baraboo to Milwaukee a part of the program promoting the Great Circus Parade through the streets of the city. Richly illustrated with images culled from the Circus World collection, copies may still be purchased from the Mid-Continent Railway Historical Society. For the complete text of this special issue click here.